Brazilian Musician Hermeto Pascoal's Art Knows No Boundaries Pascoal, 81, occupies a special place in Brazilian music. Though he began to make his name in post-bossa nova Rio de Janiero, Pascoal's taken his music way past that — deep into the Amazon and beyond. No Mundo Dos Sons, the latest album from Hermeto Pascoal and his group, is available now. Brazil's Hermeto Pascoal is a legend among musicians and fans for his ability to conjure beautiful sounds out of just about anything — from tea kettles to PVC pipes to traditional woodwinds. Earlier this May, the New England Conservatory awarded Pascoal an honorary Doctorate of Music degree and in July, the 81-year-old released No Mundo Dos Sons, the first album from him and his group in 15 years. Pascoal can come up with a melody at the drop of a hat. He says he's written 9,000 compositions and most, if not all, were created on the spot. "It's because I'm 100 percent intuitive," he says. "I don't premeditate anything. I feel it. When something happens, I don't say, 'Now I'm going to do that.' No. If I want to write the music, I start creating. Every piece of my music, even the one I write on a piece of paper, I consider an improvisation." Pianist Jovino Santos Neto is a professor of music at Seattle's Cornish College of the Arts and agrees with the impromptu nature of Pascoal's work. Santos Neto was also a member of Pascoal's band for 15 years and is now the archivist of his work. "Hermeto is music," Santos Neto says. "He is the current. He's like a source or a spring that's just gushing that water, and that water is music. ... There's a saying, I think it's a John Cage thing that said, 'Music is playing all the time. Music continues, we just kind of dip into it once in a while.' Well, Hermeto is fully immersed in it. So because of that, whenever you are close to him, you just see [that] the music is just coming out." Pascoal was born in a small farming town in the northeastern Brazilian state of Alagoas. He dropped out of school in the fourth grade — there was no such thing as special education back then for a child with the vision problems that come with albinism. His father taught him to play the accordion and in the early 1960s, Pascoal moved to Rio de Janeiro. By then, he'd picked up piano and flute and began recording with some of the new generation of Brazilian musicians, including Quarteto Novo. Quarteto Novo's percussionist was Airto Moreira, who went on to play with Chick Corea and Miles Davis. Moreira recommended Pascoal to Davis and together, the trumpeter recorded with the Brazilian on the album Live-Evil. Santos Neto says one of Pascoal's compositions for Miles, titled "Little Church," was inspired by the Brazilian's childhood memory of hearing his mother and her friends singing novenas to the Virgin Mary. "[Pascoal] would hear these voices wafting through the walls of the church," Santos Neto says. "He was scared to go inside, so he'd sit outside and listen as his mother was singing. So he wrote this gorgeous melody." Pascoal recalls an interview Davis gave in which the trumpeter was asked how he'd like to return from the afterlife. "'I would like to be a musician like that 'crazy albino,'" he says, recalling Davis' response to the question. "[Miles] used to call me 'crazy Brazilian albino.' And to make music like that of Hermeto Pascoal, the 'crazy albino.' I was very happy when I heard that." That's typical of Pascoal's personality says Santos Neto. In the more than 40 years Santos Neto has known the older musician, Pascoal has never changed. "He never aged and he's at the same time...a very complex personality," Santos Neto says. "He's both the wise old man, because of the white hair, but he's also the prankster, the 16-year-old who's really crazy to play a prank on somebody and to laugh and to make jokes." Pascoal doesn't make jokes about his honorary Doctor of Music degree from the New England Conservatory. He says it's one of the greatest recognitions of his life. But this acknowledgement reinforces something he's believed for a long time. 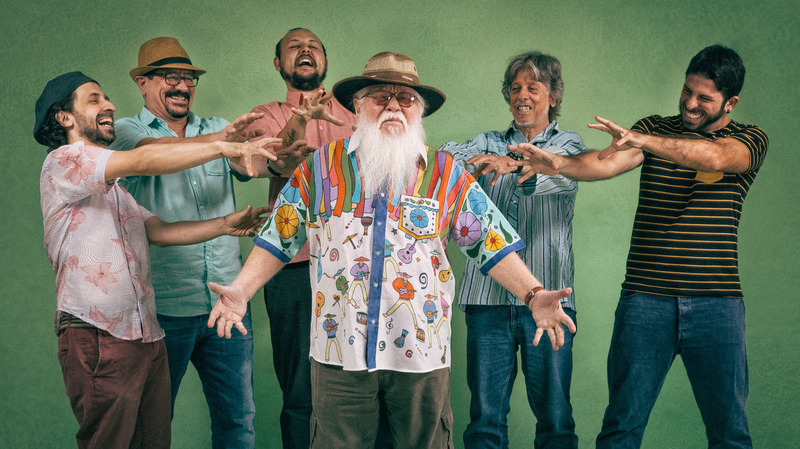 "Hermeto doesn't make Brazilian music, he makes music in Brazil," Pascoal says. "Therefore, Hermeto is a Brazilian citizen only on a piece of paper. But in my music, I'm universal." And, as the title of his new album says, Pascoal will always be No Mundo Dos Sons — in the world of sounds.